Patricia posted yesterday that she liked the color combinations that had we put together for Patti a few months back for a room with an existing forest green carpet that she couldn’t afford to replace. Patricia also has a forest green carpet and had originally pulled it together with a waverly comforter that matched a green ivy pattern in her bathroom. She’s ready for a new look and loved the color pallette that we created for Patti. Patricia had mentioned that she was considering using Martha Stewarts Greenhouse pattern and when I googled it, I found that it’s a fabulous choice and even better – it has an amazing price tag. 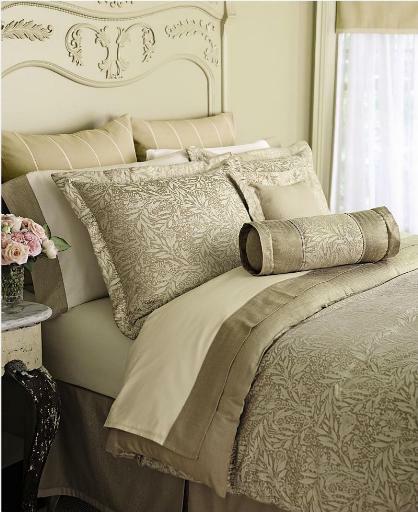 It’s a 24 piece set that includes everything from sheets to draperies and includes two decorative pillows. I really like the mix of texture and pattern that is used within the set. It will do a good job of pulling together Patricias white walls and the neutral colors that she prefers. The orginal price at Macy’s is $500.00, but a queen set is marked down to $150.00. For all you macy lovers out there, I know you can find a great coupon to get it even lower! This set would work for any bedroom and for anyone fighting a carpet that they don’t like – it’s an easy inexpensive way to tone down the carpet and get a great look on a tight budget. 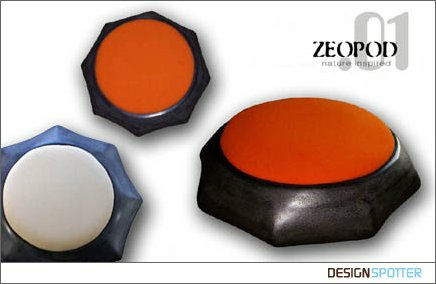 Add accessories in lighter or darker shades of the carpet or pick shades of a complimentary color and instantly, you’ll have a fresh new look. I’m hoping that Patti and Patricia will send us pictures when they are done! It would be fun to see! Thanks for sharing your thoughts Patricia – you found a great deal! Bill’s e-mail ever so charmingly suggested that perhaps I was recovering from an evening at Studio 54 or the Pub at Columbia University and had missed that class. I have absolutely no idea what he is talking about (haha! ), but I assure you that he was quick to refresh my memory! I must have missed those cliff notes, as he smuggly explained that the Designer’s name for a large round ottoman is a Pouf. 1. A woman’s hairstyle popular in the 18th century, characterized by high rolled puffs. 2. A part of a garment, such as a dress, that is gathered into a puff. Although the dictionary says a pouf is a large round ottoman, you’ll find when googling it, that the design world loosely applies the name to ottomans of many shapes and sizes – even those with a small back. 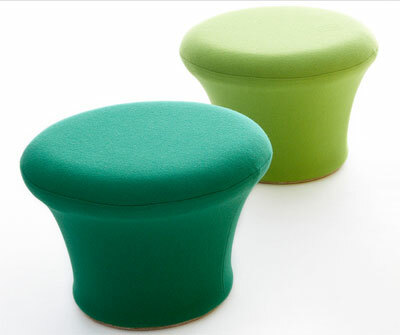 Here are some Poufs that I found.